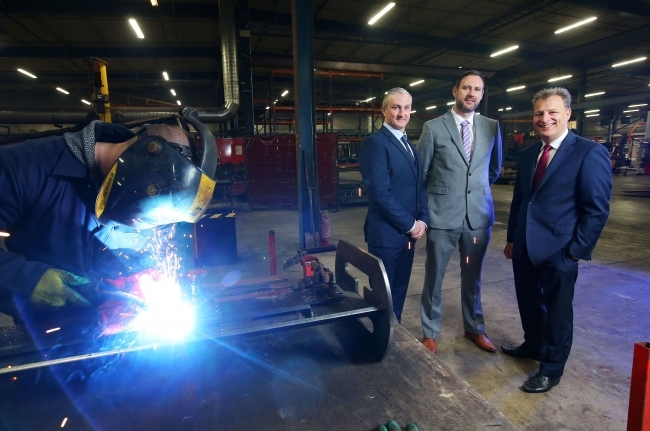 With support from Invest Northern Ireland GES, is investing £1.9million to upgrade its facility, purchase new machinery and create 61 new jobs across a range of roles. Announcing the investment, Invest NI’s Executive Director of Business & Sector Development, Jeremy Fitch said: “Invest NI’s offer of £396,000 is enabling GES to undertake growth development plans aimed at positioning the business so that it can manufacture and export more components, particularly into North America. He added “The 61 new jobs being recruited over the next three years range from manufacturing roles to procurement and sales positions and will generate £1.3million annually in additional salaries. GES manufactures products from high strength and wear resistant steels for Original Equipment Manufacturers (OEMs) of quarrying, mining, construction and agricultural equipment based in GB, the ROl, the EU and the US. Its customers include major materials handling businesses including Terex, Telestack, Sandvik and McCloskey International as well as global companies such as Kleemann Wirtgen, Astec Industries and Kuhn Farm Machinery. John McClenaghan, Managing Director of GES, added: “This expansion is part of a strategy to grow sales and increase both our workforce and our product offering to meet identified opportunities within new and existing markets. We have set ourselves a challenging target for new export business and will be focused on leveraging our reputation in the industry to secure new customers.